In a rematch of the past four NBA Finals, the Cleveland Cavaliers are hosting the Golden State Warriors at Quicken Loans Arena on Wednesday night. CLEVELAND -- Who said this rivalry is dead? Even with LeBron James having taken his talents to Los Angeles, it appears the Golden State Warriors still bring out the best in the Cleveland Cavaliers. In the first half of a rematch of the past four NBA Finals, the Cavs played some of their best basketball of the season before heading to halftime with a 64-58 lead over the 2-time defending world champs. After jumping out to a 12-2 lead to start the game, Cleveland fell behind by as many as 8 points as Warriors All-Star Stephen Curry scored 25 first-half points. 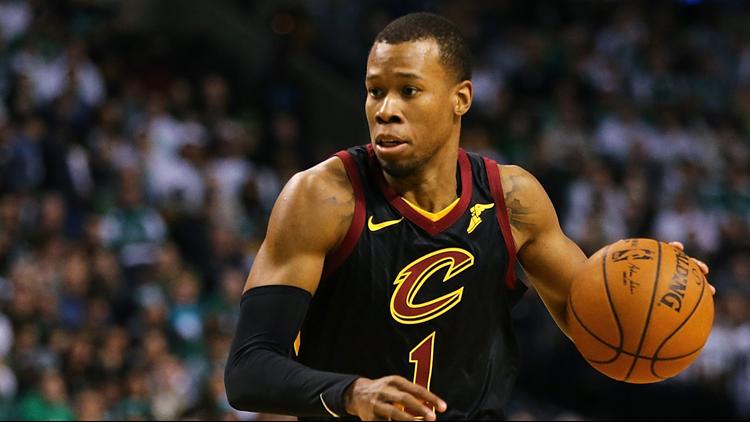 Nevertheless, the Cavs still took a lead to the locker room, thanks in large part to a 13-3 run to close the half, which came to an end when Rodney Hood sank an off-balance buzzer-beater off an improvised pass from Jordan Clarkson. Prior to Hood's buzzer-beater, rookie point guard Collin Sexton sandwiched a pair of 3-pointers around another 3-pointer from forward Cedi Osman. In his first career game against Golden State, Sexton has scored 12 first-half points and perhaps more importantly once again showed that he's not afraid to go at one of the NBA's top teams. In addition to their late-half run, Cleveland has benefited from committing just 5 turnovers, while making 10 of their 20 3-point attempts. For all the latest from Quicken Loans Arena on Wednesday night, follow our live blog and join the conversation on social media using the hashtag #3Cavs.